2006 Suzuki JR 50. Picture credits - Suzuki. Submit more pictures. Learning to ride doesn�t get any better than this. The JR50 is sized for beginners, with a smooth powerband and lightweight handling designed to inspire beginners with confidence. On top of that, it has a variety of safety features that let Dad and Mom control their youngster�s progress. Price as new (MSRP): US$ 1099. Prices depend on country, taxes, accessories, etc. 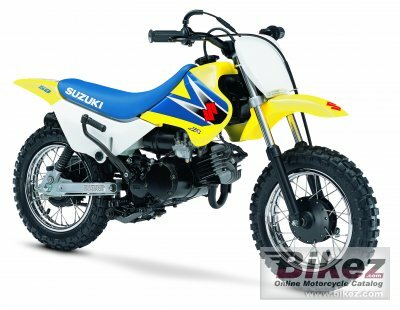 Ask questions Join the 06 Suzuki JR 50 discussion group or the general Suzuki discussion group. Bikez has discussion forums for every moped. View comments, questions and answers at the 2006 Suzuki JR 50 discussion group. You can sign up for e-mail notifications when other riders answer you. If you have extensive experience with the MC, please send us a review. If you consider buying this bike, you should view the list of related motorbikes Look at photos. Compare technical specs. And check out the rating of the moped's engine performance, reliability, repair costs, etc. You can compare the rating with other bikes.